Congrats again! He/She is beautiful! 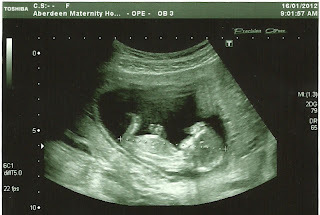 Always love seeing baby scans :) So precious! Yay Christy! Hope you are feeling well! I've been thinking about you! Love that sonogram!! What a beautiful little baby you are growing. Hope you are feeling better. Missing getting the news in person but so very happy to you Sumner clan! Now when you come retrieve your suitcases you'll have a new wee one in tow. Love it and love you! Wonderful news! Congratulations Sumner family. I hope you are feeling well.